Happy New Year! It is that time again when we convince ourselves that if we declare a New Year’s resolution that somehow it will come true. I am someone who works out at a local gym at least two to three times a week. Each year I notice that at the beginning of January, I cannot find a treadmill to walk on because the gym is packed! Come February, we are back to “normal”. Back to the same old routine… and my treadmill is waiting for me like a trusted companion and friend. YES! The reality is that most resolutions last about two weeks to a month. Lifetime changes can be achieved, however, when we set ourselves up for success. Because resolutions don’t seem to last, I do not make “Resolutions” any more. What I do instead is take a personal inventory. I seek awareness and I take RESPONSIBILITY for the life I have created and want to improve for myself. I take responsibility for the good, the bad and the ugly… Yes, I used the “R” word!!! We all have things we want to change or improve upon in our lives. To help support us on our 2014 New Year’s “Responsibility” journey, my first radio show of the year, this Saturday, January 4, 2014, will be all about tips on how to achieve the life you desire. I have a few areas I want to improve; One of my goals is to create unity within my family and another is to get off the last pharmaceutical prescription I am on… Synthroid. (I want to use herbs to get the same job done.) So, what area in your life do you seek awareness and responsibility? I look forward to reading your comments! 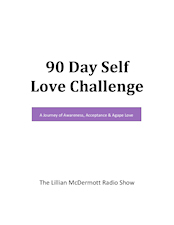 The Lillian McDermott Radio Show ~ Saturday, from 12 pm to 2 pm ~ On “The Talk To Me Station” AM 1300 WMEL & Worldwide on www.WhenYouNeedaFriend.com. That really hit home for me! It was a great reminder that just because I don’t achieve happiness immediately, it doesn’t mean that I should give up and abandon crearing the life of my dreams! Thank you for your feedback Lauren… Never give up on your dreams! Sometimes we can forget that doing what is right for ourselves requires laser vision, especially when having long term goals. Create a vision board to help remind you of what you want to accomplish and when you get discourage, visit your vision board. (Take a picture of your vision, with your cell phone so you can have it with you at all times!) It is a quick way to shift to what you want. If we are unhappy, then we are either dwelling on the past or worried about our future. We must focus on the moment and what we want to accomplish. When we revisit the past, then do so to learn from the experience, take 100% responsibility and use the lesson to create a better future. Peace comes when we stop trying to recreate the past! Great article! When people actually decide to work on their own self awareness, everything seems to fall into place for them to see the possibilities of achieving their goals. Two years ago I started my own self awareness journey and discovered a “ME” I didn’t know existed and always wanted to be. My life was fine prior to that moment; I have a wonderful husband, fabulous children a great career and I have always been open to personal growth but there was something within me I was ignoring… my discontentment! I wanted something different and I just didn’t know what or how to achieve it. Going to TMC Productions in Fort Myers, was different and way out of my comfort zone but it helped me see some truths about myself that needed embracing. I discovered that after many years of marriage and raising my children, I had forgotten who I was. I needed to reconnect with myself and discover the person I am today. I am aware that I create everything that happens in my life and can take 100% responsibility. I know what I want and believe I am enough to achieve it! Thank You for making a difference in my life and the lives of so many others. I love you Tina! PS: I do not get a penny or a dime or a dollar, for promoting TMC Productions; just satisfaction… I believe in the work they do and see how they are changing lives for the better!